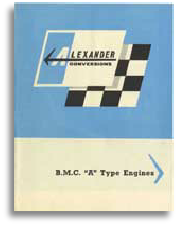 A letter regarding the Alexander tuning kits available for the BMC Mini range. 1960. 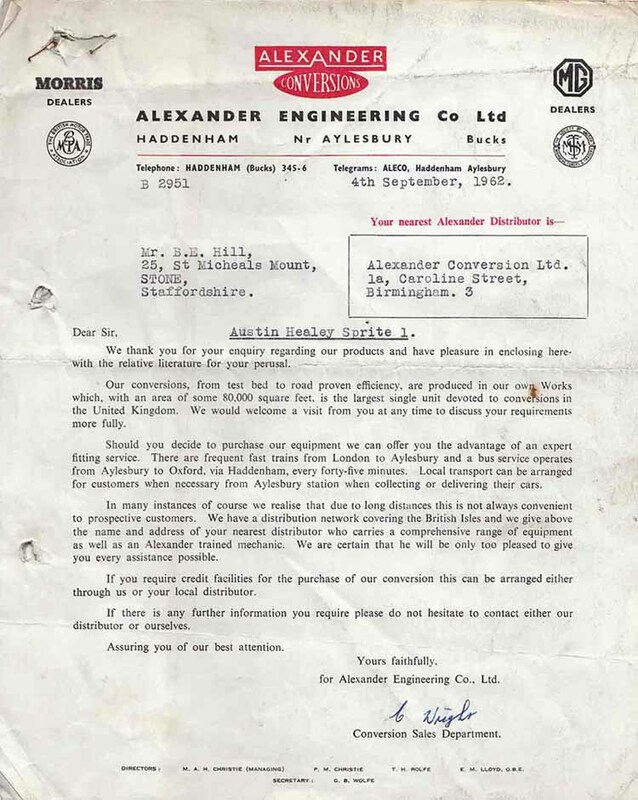 A letter regarding the Alexander tuning kits available for the BMC A40. 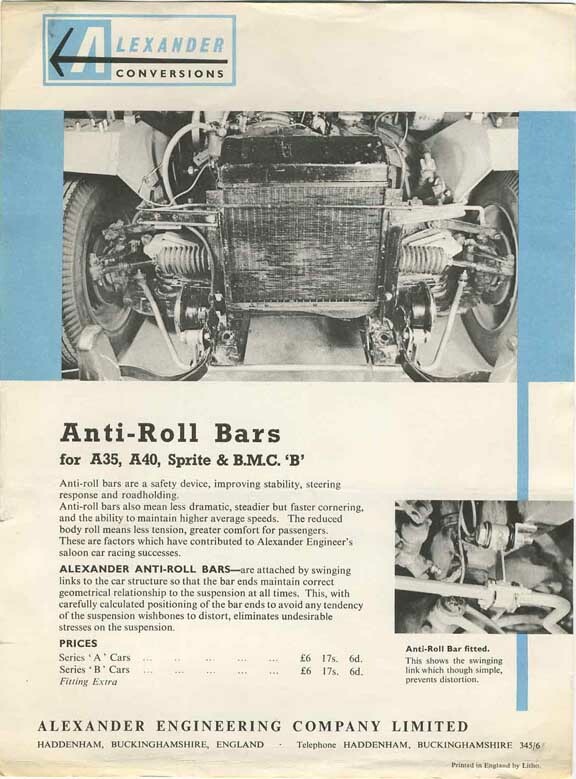 Early 1960's Brochures for A Series Powered Cars. 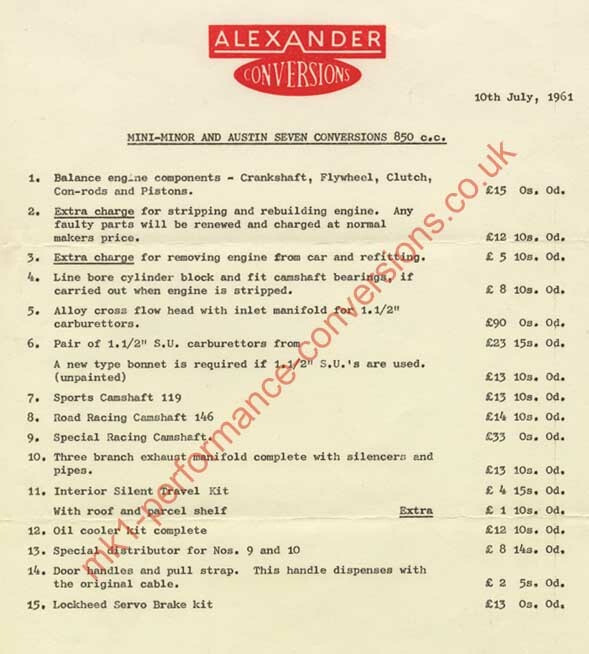 Alexander Conversions For the Austin Healey Sprite. 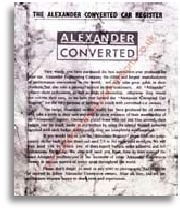 Convert your AH Sprite the Alexander way. 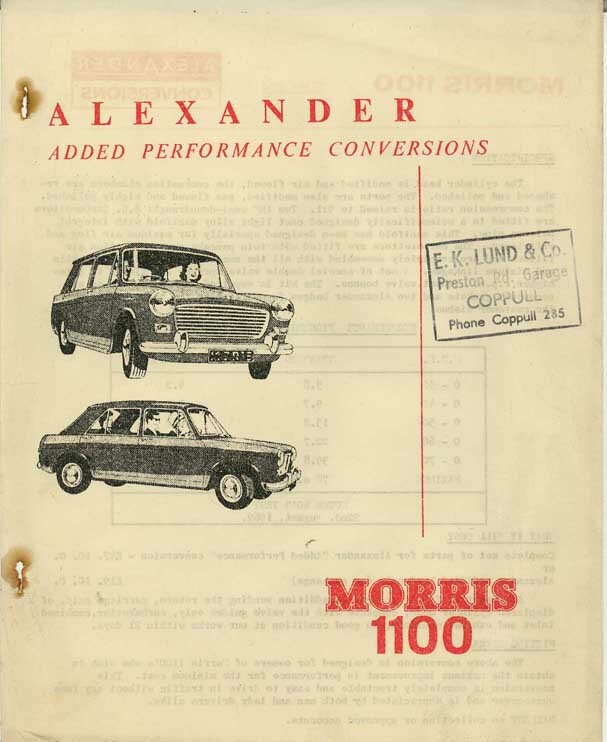 A very early flier produced to promote the Alexander kits available for the Mini. 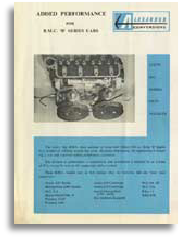 A very early flier produced for the B series range of cars. Alexander Conversions For Non Transverse 'A' Series Cars. 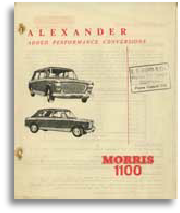 Throughout the 1960's the Austin & Morris 1100 range of cars was consistently BMC's best selling & most profitable range. As such it was always a major target of the tuning houses. Reproduced here we have a complete copy of the Press release produced by Alexander unveiling their new range of tuning kits for the 1100 range. 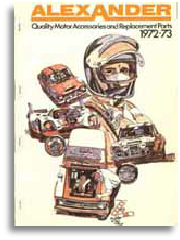 This is followed by a slightly later productionised version of the 1100 tuning brochure. Full specification & Price list. 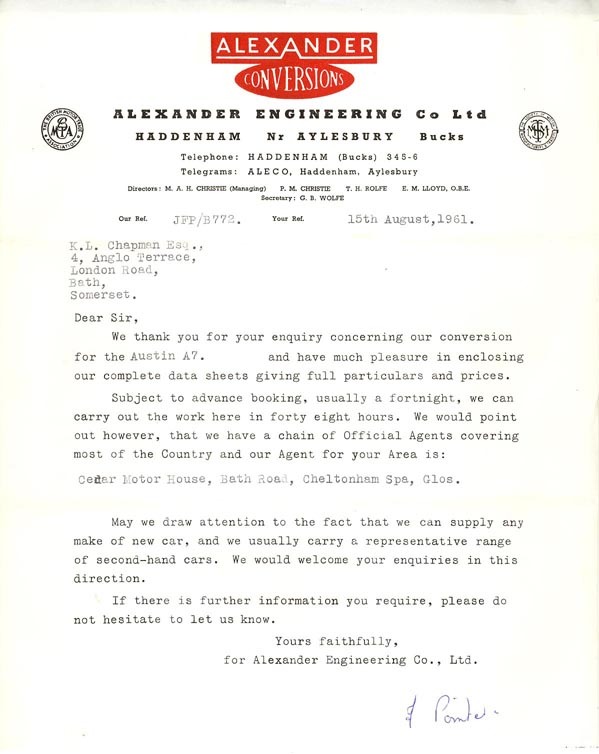 Alexander Equipment for Sprite & Midget. 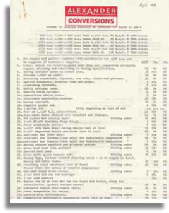 A comprehensive list of tuning equipment available for later versions of the Sprite & Midget. Alexander Appendix J Racing Conversion. 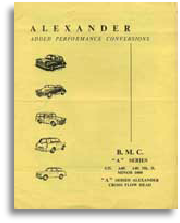 A comprehensive price list detailing Alexander conversions for Racing Minis. Alexander Conversions for the MGB. 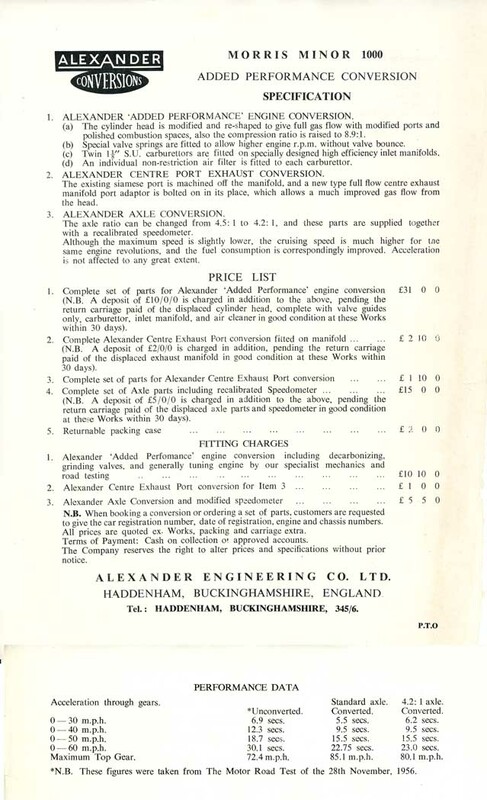 Alexander Racing Conversions for the Sprite & Midget..
Alexander Catalogue Dated 1972 - 73. 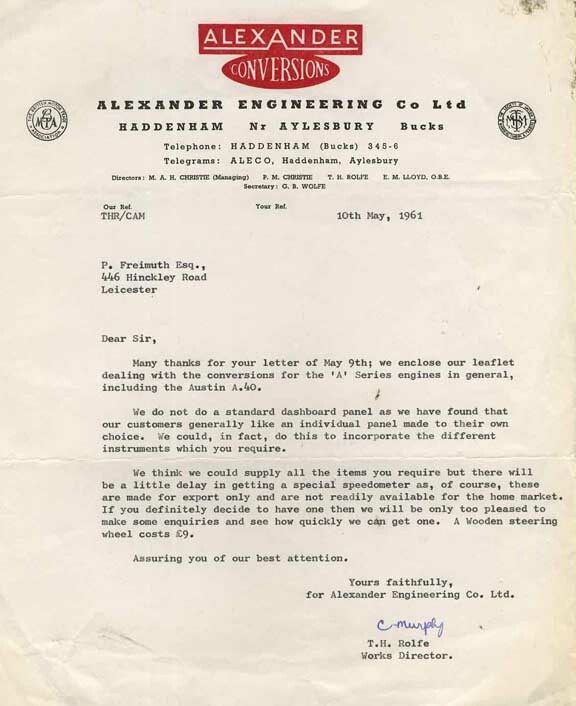 By the early 1970's Alexander were no longer the power in tuning that they had been over the previous 15 years or so. 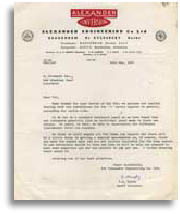 By 1968 they had finished offering modified performance cylinder heads and they continued their "re alignment" over the next few years. By the time this catalogue was published in 1972 there is little evidence of their once great tuning prowess, they are still offering their Alexpress bolt on kits and an impressive range of Alexander branded Smiths instruments, but sadly the majority of the rest of the contents fall into the tat category. 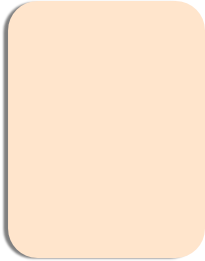 Amazingly it was during this period that Alexander made most money! 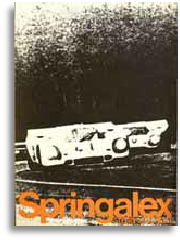 Alexander / Springalex Catalogue 1972. 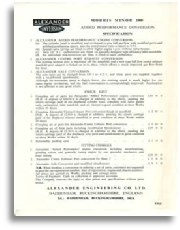 Originally published as part of the above Alexander catalogue I thought that this Sprinaglex wheels catalogue deserved separating for the purposes of this site. 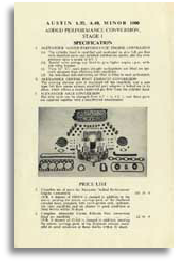 In the late 1960's the legendary steering wheel manufacturer Springall were in serious decline, for too long they had concentrated on quality over profitability until the demise of the company became inevitable. 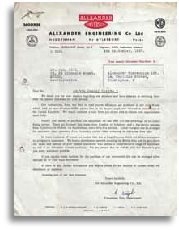 The business was sold to Alexander Engineering becoming Springalex (a compound word made up of Spring from Springall & Alex from Alexander Engineering). The new company's wheels could never be described as beautiful, but they were strong & functional, finding favour with the Works Escorts of the early 1970's. 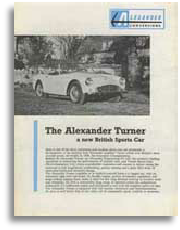 Manufactured as a joint effort between Alexander Engineering & the Turner Sports Car Company. 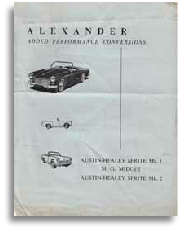 The Alexander Turner was an A series powered light sports car featuring an Alexander 7 Port head. 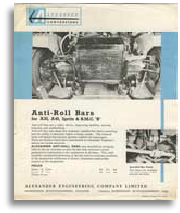 The most famous and sought after of all Alexander's tuning accessories. 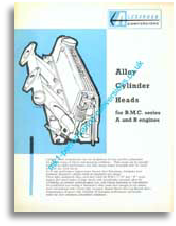 This is a cracking flier that gives lots of details on these classic heads. 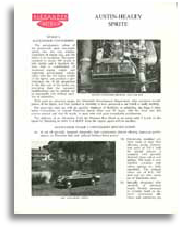 Alexpress Flier On Stromberg Carbs. 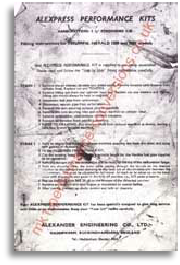 Alexpress Flier, Specifications & Prices. A Price breakdown for a number of Alexpress Kits. 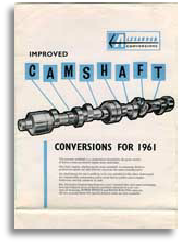 A very popular piece of "Tuning equipment" in the 50's & 60's almost every tuning firm offered their version of this particular item. 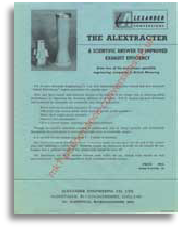 A flier concerning the range of Alexessory accessory products. 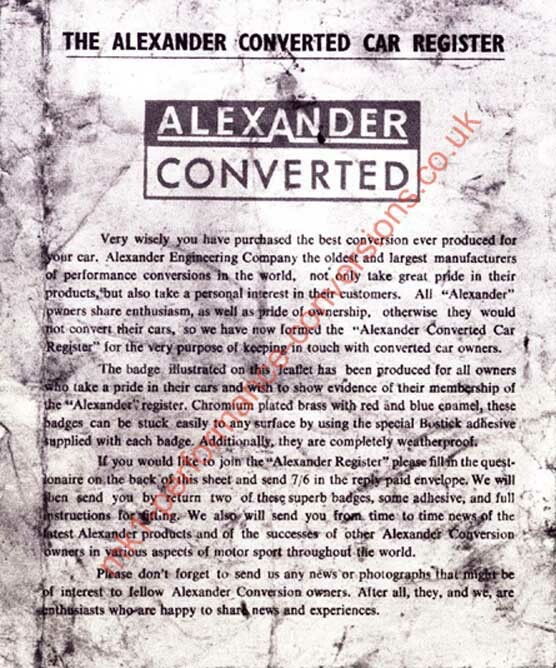 "Join" the club for Alexander modified cars. 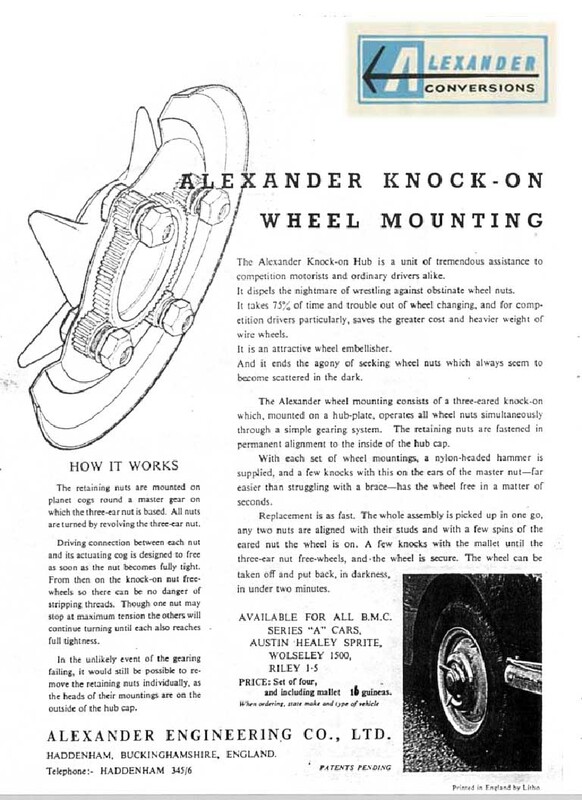 Alexander Knock on Wheel Conversion. A bit of an odd one this. 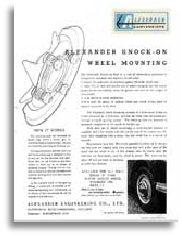 Convert your normal road wheels to knock on using this Alexander kit. 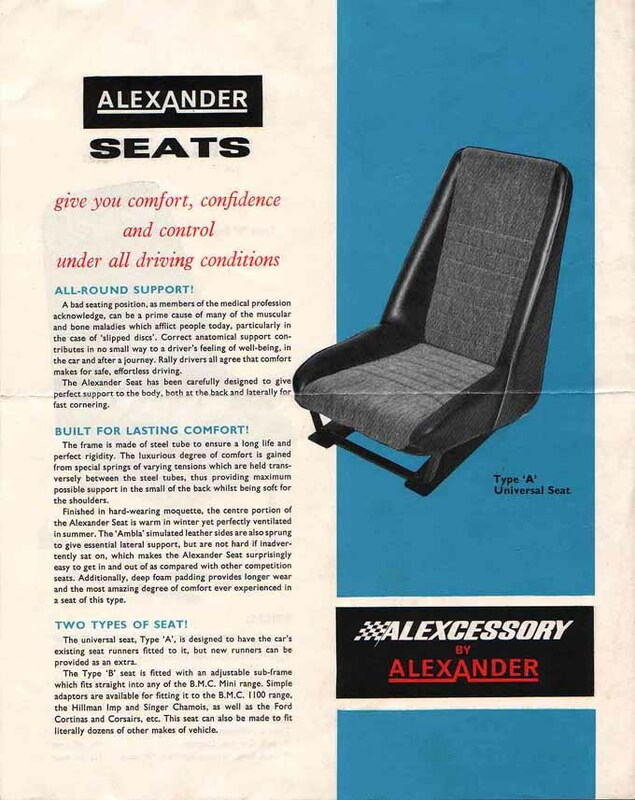 A flier dedicated to Springalex steering wheels. Produced exclusively for dealers & agents. 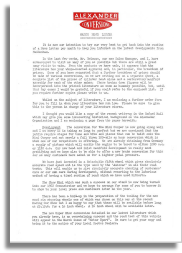 This Newsletter kept everyone "up to speed" regarding new developments. 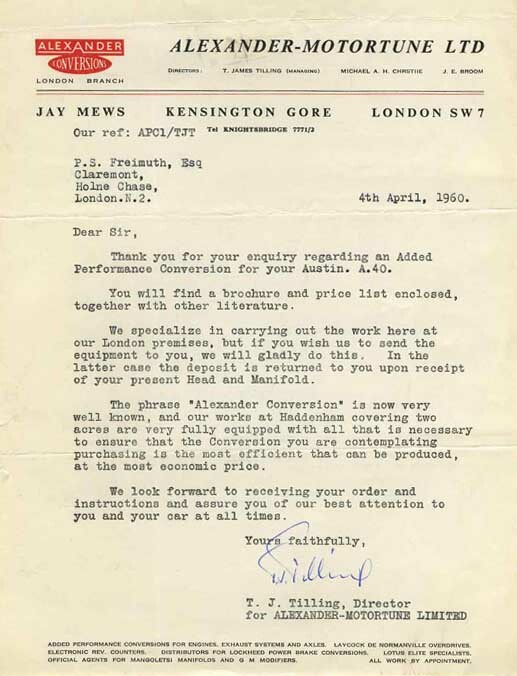 As a large part of this one refers to the "New Mini Cooper" I assume it is March 1962.